I would like to thank Jenny for having me as a guest poster. I will admit, up front, that this is my first guest post so I am a little bit nervous. I mean Savour the Senses features such beautiful and delicious food I hope I can live up to it. My name is Rachel and I write My Naturally Frugal Family. I am a mother of 3 (2 boys and 1 girl) and my blog is a diary of the yummy and mostly healthy foods I prepare for them. I am an almost vegan (I still like a little bit of cheese) and have found that I feel healthier and more vibrant now that I have taken on a plant based diet. 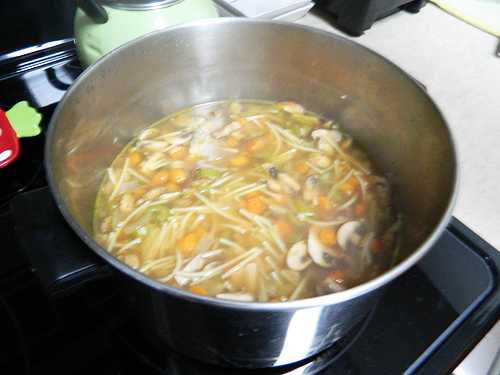 Today I have a vegetable soup that I would like to share with you. For the broth you can use an already prepared version, but at my house we always have a vast supply of veggie leftovers that we can use to make our own broth. In a skillet saute, with Earth Balance (or butter if not preparing vegan), the garlic, onion, celery, carrots, and leek (until tender). Be sure to season to taste with salt and pepper. Add both varieties of mushrooms and continue to saute for 5 minutes. Add the vegetables to your pot of broth and heat through. Season with your paprika, garlic salt, black pepper, basil, and thyme. To the finished broth add 1 cup of cooked spaghetti (or rice) chopped into bite sized pieces. You can change the amounts of the seasonings to your liking which is what is so handy about a vegetable soup (you can make it as spicy or mild as you like). So what is your favorite soup? I hope you have enjoyed my post and I hope to see you over at My Naturally Frugal Family. Thanks so much Rachel! This looks great for the cold December weather! If you or somebody you know would like to be a part of this new tradition please e-mail me at savourthesenses (at) gmail (dot) com and we can get you scheduled! Yum! The soup looks delicious. Great job Rachel! Nothing to be nervous about at all – you were fantastic! Thank you Jenny for having me, it was pleasure. This is one of my favorite comfort foods ever, and I love a homemade version 🙂 Great recipe for this season, Cleveland is covered in snow! 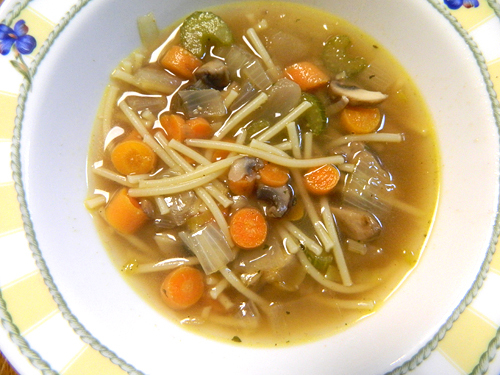 Rachel is my lovely daughter, and I can vouch for the yummy deliciousness of this soup! Soup looks so good. Perfect for a cold day. Great guest post. Ooo, I like this new tradition. I don’t know what I’d share or I’d email you right now, hehe. And the soup sounds yummy. No snow here yet, but it’s definitely getting colder. I love your noodle soup! Perfect for this time of year. Great guest post Rachel and Jenny! I’m here from Rachel’s site. Hi Jenny! I love checking out soup recipes and this looks perfect for cold weather. Thanks for sharing delicious soup recipe Rachel! I don’t usually put pasta in the soup, but I think my kids will enjoy it! Loved your first guest post, Rachel! You’re a natural! And Jenny, it’s so nice to visit your blog!